Autodromo is simple and classic fruity slot game. Over the years, slot games have become more and more complicated to the point where they’ve lost their essence! Some developers nowadays are so into making slot games so overcomplicated and fancy but they’re just not worth playing! Just because a slot game looks epic doesn’t mean it’s fun or satisfying to play, or that it pays out any money. This is where Novomatic gets it right. Players love this developer for the simple reason that they make great slot games. We love Novomatic, too! That’s why you can play Autodromo here for free, along with all of their other games. You can read our reviews of all of Novomatic’s slots, table games and live casino games. Autodromo has three reels, three rows and five paylines. There’s nothing extra, there are no free games, it’s just a great slot! There are proper slot symbols on the reels – very recognisable ones! You’ll hear familiar sounds as the reels spin and stop. They each land with a familiar click and the famous Novomatic bell rings when you get a big win. 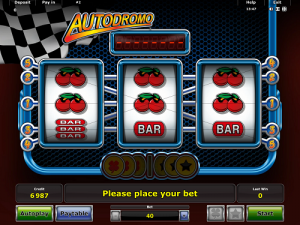 A simple gamble game can be played when you get a win and Autodromo can also be played in autoplay mode. Slot machines have been around for over 100 years. Players love to watch the reels spin and see the familiar symbols match up! Each slot has its own unique paylines and its own unique symbols. However, there are certain symbols which were seen on the very earliest slot machines that are still around today. These classic slot symbols have stood the test of time and it doesn’t look as though they’re going anywhere any time soon. Autodromo’s symbols are all traditional slot symbols. Some don’t pay out very much, whereas others pay out huge amounts! On the reels of Autodromo, you’ll see: cherries, lemons, oranges, golden bells, grapes, watermelons, bars, double bars, triple bars and jokers. All of these symbols have a very Novomatic feel and design to them, even though developers use and have been using them the world over. There’s a typical Novomatic style to them that simply can’t be missed! There are five paylines in total, running across the reels. You’ll need to match three symbols and have one identical symbol on each of the reels, on positions that follow a payline, in order to get a win! You can open up the paytable to see the paylines, the payouts and the rules. To open the paytable, click on the button at the bottom of the screen. You’ll the payout value for each symbol and this is the amount you’ll get paid when you land three of them, one on each reel, following a payline. The paylines run horizontally and diagonally across the reel. The slot game shows you, after you get a win, which symbols formed the win and the payline also lights up. This makes Autodromo a fantastic game for beginners. There’s nothing that you can possibly get confused about! Retro slots lovers will love to spend their time spinning these reels. This is classic slot fun at its best! Novomatic is one of the world’s most famous casino games developers! They make slot machines, online slots, table games and live casino games. Gamblers love Novomatic games because they’re always spot on. They might not be the most stylish or the fanciest of game but they are always fun to play. Novomatic games also pay out! Most of their games have RTPs of over 95%! On our site, NovomaticCasino.co.uk, you will find thorough reviews of all of their games. You can play every game made by Novomatic for free. We also know the best Novomatic Casinos where you can play them for real money!